White bankers boxes, some tattered, others torn, are stacked in various closets and other available storage nooks in America’s largest home. They don’t seem special, but these boxes contain Christmas magic. A young woman sits on the floor, fluffing bows and examining ornaments. Cranberry sprigs and gilded magnolia leaves are spread out on the floor and tables. It’s early October in Asheville, and though planning began just after the previous Christmas and continues throughout the year, the physical Biltmore Estate Christmas transformation begins now. Next month, the first of tens of thousands of guests will wind their way through the halls of the manor, taking in the beauty of 55 Christmas trees, exploring lavish art and antiques. Every Biltmore Estate Christmas tree has unique toppers, including elements such as ribbon, poinsettias and feathers. 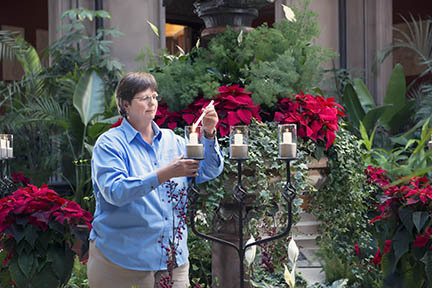 During evening candlelight tours, fireplaces will light mantels filled with flowers, ornaments and ribbons, and poinsettias will fill the estate. Lizzie Borchers oversees the effort. Following the footsteps of longtime Christmas queen Cathy Barnhardt — who retired last year following 40 years heading up Christmas at Biltmore — Borchers, 32, oversees Barnhardt’s staff, now 25. And it takes that many — and then some — to decorate the 8,000-acre estate. Completed in 1895, the Biltmore in Asheville, N.C., was the country home of George Vanderbilt, grandson of railroad magnate Cornelius Vanderbilt. Open for public touring, the massive estate, with its French Renaissance-style chateaux, was inspired by Vanderbilt’s trips abroad. At the time, it was the largest undertaking in residential architecture history and spanned six years. The result is 250 rooms filled with the glamour of the Gilded Age. And it’s even more impressive at Christmastime. 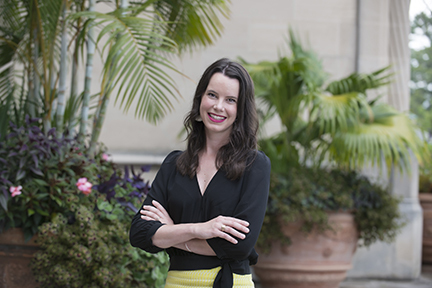 Combining a childhood spent in historic places such as Charleston, S.C., and Newport, R.I., with over 15 years’ experience in the floral industry, Borchers says the new job as head of the Biltmore Estate Christmas blends her love of history and creative floral design. The undertaking is mammoth and methodical. Tree delivery begins early in the morning in early October. 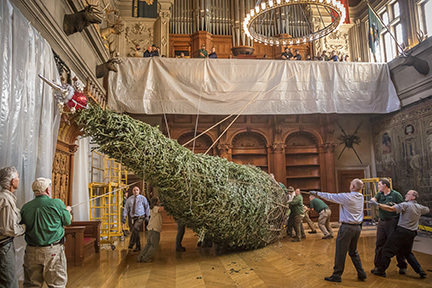 Borchers’s team brings the unadorned trees into Biltmore house. By the middle of the month, decorators have reached the first floor and begin working on the breakfast and music rooms, the tapestry gallery, library and front hall, among others. Vanderbilt loved Christmas, and staff notes that his journals reflect how holidays were centered around traditions and family. Biltmore works to continue those traditions today. Each season takes on a theme and no two years are the same. “We want to give guests a reason to come back year after year — to see something new,” says Borchers. One element of the Biltmore Estate Christmas will undoubtedly remain the same — the iconic front-lawn tree. Crane operators work to position the 55-foot-tall Norway spruce out of Avery County, N.C., and surround it with 35 smaller, brightly lit trees and shrubs — 70,000 lights in all. The smallest in the house will be a collection of 10-inch trees adorned with crystals, enclosed in cloches, in Mrs. Vanderbilt’s bedroom on the second floor. By the first of November, the Banquet Hall tree raising begins. A horse-drawn carriage delivers the 35-foot tree to the front door of the estate. It takes around 50 employees to hoist it up, carry it and secure it in place. With every aspect of the decorating, it takes a full team effort. Engineers are a critical component of the process, too, helping to move the trees, hang the garland and run the hundreds of electrical wires inconspicuously throughout the home. In all, around 45,000 lights and 150 candles light the home at Christmas. But it isn’t just the house that enjoys a full holiday overhaul — the full estate is adorned and filled with thousands of strands of twinkling lights. Luminaries light pathways. Every aspect of the home and estate is filled with the spirit of the season. To experience the estate like Vanderbilt’s guests would have, take the candlelight tour. Carolers and solo musicians add joy to the halls, as each room emits a soft, peaceful glow. 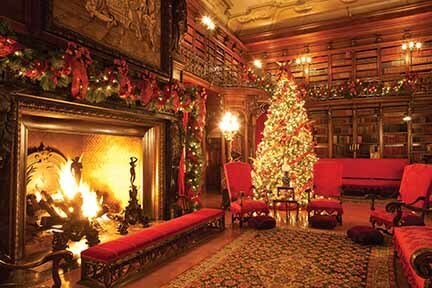 AAA Members receive a discount on single day admission to the Biltmore Estate Christmas! Reservations to tour the Biltmore are recommended during the holidays. Purchase your tickets at your nearest AAA Travel office.